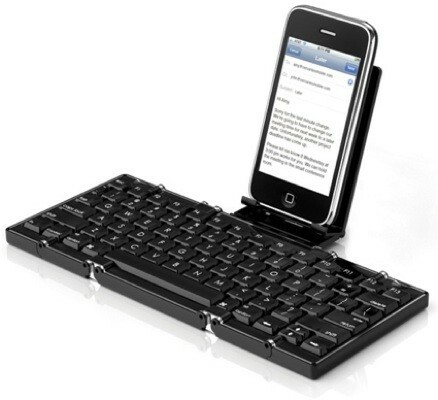 Of all the Bluetooth keyboards that have been released for portable devices lately, this is certainly one of the coolest ones. Cervantes Mobile’s Jorno doesn’t look particularly comfortable, but it does fold up into a tiny square, it’s got a cradle that will fit most handsets, and it’s compatible your favorite Bluetooth HID profile-enabled devices. It will be out early next year for $99, although if you pre-order it now you can get it for a smooth $79 — which is probably the upper limits of what I’d pay for it. That is, if I were going on a modern day On The Road-type odyssey with nothing but a backpack and my dreams, and an iPad to keep a journal of my thoughts. Interesting idea though. OK… I have to agree with you. This does seem frivolous, but it is kinda cool for those that already have Ipod/Ipads/compatable mobile devices and want this kind of flexibility. I wouldn’t want this because that is what I have a notebook for, and as you say, at $99 it doesn’t come cheap but there is obviously a market for it for those with money to burn and it may be practical for them.